In 2014, a study by the Australian Institute of Health and Welfare confirmed 40,844 children were abused or neglected. That equals 1 child every 12 minutes who suffered emotional, physical or sexual abuse or neglect, often from someone they knew and trusted, and most often in their own home. The study estimated that thousands more cases went unreported. The statistics are horrifying. What can you do to help? For over 27 years, Brisbane-based charity Act For Kids has been providing free early intervention services for children and young people who have experienced abuse or neglect. Act For Kids has grown into a large organisation with 250 staff who provide therapy and support for children and families, empowerment workshops and education, youth mentoring and family coaching, and safe houses in remote Indigenous communities. As the organisation grows and continues to provide these free services, so does its operating costs. While Act For Kids receives some government funding, it relies heavily on fundraising and donations from the community in order to continue expanding and developing its services to reach and assist vulnerable kids. The Act For Kids Lottery is one of the major fundraising activities for Act For Kids, with proceeds from ticket sales contributing vital funding toward the cost of helping at-risk children. The Act For Kids Lottery takes place six times every year and tickets are limited to 9,000 for each draw, meaning you have better odds of winning! Plus, any spend of $100 or more gives you the chance to win bonus prizes worth $25,000. First prize is a brand new Mercedes-Benz luxury car, and if you buy a ticket book you will also have a choice of a bonus prize – a platinum bullion or an extravagant holiday worth up to $25,000. Tickets are available online from Oz Lotteries any time up until the draw closes. Best of all, you’ll know that every ticket sold contributes to a child’s safety and well-being. You can also contribute in other ways through building a support network in your local community, connecting with parents and caregivers, and becoming a ‘safe’ person in a child’s life. You should trust your gut instincts if you notice something that concerns you and contact the appropriate authorities in your state. As the saying goes – it takes a village to raise a child. The latest Act For Kids Lottery draw is now open! 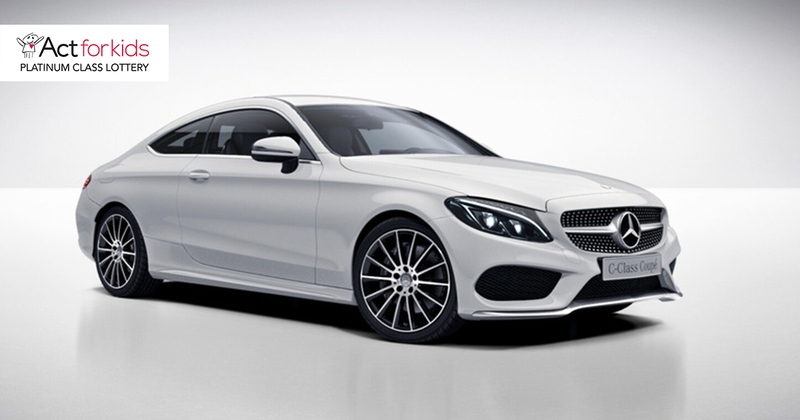 You could win pure luxury Mercedes-Benz C300 Coupe worth a $95,185 RRP. Plus you also get up to $2,500 towards CTP insurance, registration, accommodation and flights to pick up your car, or transport the car to you. Total first prize value up to $97,685! Tickets for the current draw are on sale now.